Welcome to St. Patrick School and thank you for considering us for your child’s spiritual, academic and social growth. We are a Christ-centered Catholic school with more than 400 students in kindergarten through eighth grade. As a Catholic school, we are blessed to be witnesses to our faith as we pray, provide service, build community and evangelize to others as part of our daily routine. While our faith is at the center of our school life, we also strive for academic excellence and responsible citizenship. Our teaching and learning practices are rooted in the development of personal responsibility in all areas of our lives. We respect the dignity of each child and promote respectful behavior in the school environment. In addition to a challenging curriculum, our students have many unique opportunities for leadership roles, public speaking and Christian service projects. St. Patrick also offers families a stable and continuous academic and social experience throughout their children’s elementary and middle school years. Our doors are open to you with the assurance that we will be at your family's side providing excellence in teaching and learning in a responsible and respectful manner. Join us to make this an even more remarkable community. St. Patrick School is a Christ-centered Catholic diocesan school educating children in grades K-8. We provide a safe, challenging and nurturing environment for your children. In the tradition of the Dominican sisters, each student is encouraged to develop a sense of personal responsibility, respect and reverence to God in order to grow emotionally, socially and spiritually. The school actively engages with students to help them recognize their strengths and abilities. St. Patrick School encourages parent involvement and collaborates with students, family and staff for educational excellence. St. Patrick School provides a stimulating academic environment for all levels. Fully accredited by the Michigan Non-Public School Accrediting Association, we offer low student-teacher ratios, a challenging curriculum and highly qualified and dedicated teachers. Each of these things builds a strong foundation of academic preparedness and success. In addition to our core curriculum of reading, religion, math, English and social studies, we offer physical education, art, music, computers, library and Spanish. Students at different grade levels can participate in drama, yearbook, band and peer mediation. 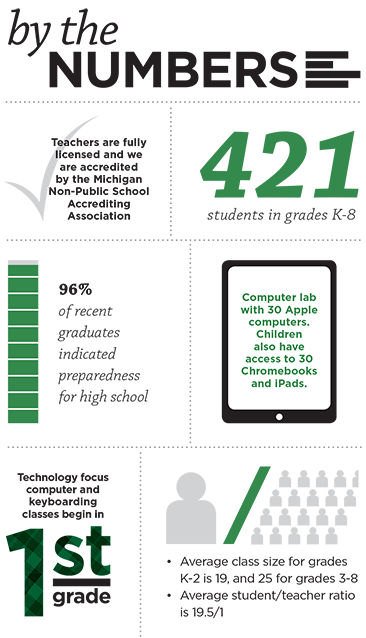 Our students learn computer and keyboarding beginning in the first grade, and have access to Chromebooks, iPads and a computer lab with 30 Apple computers. At St. Patrick School, prayer and faith are integral parts of each student’s school day. 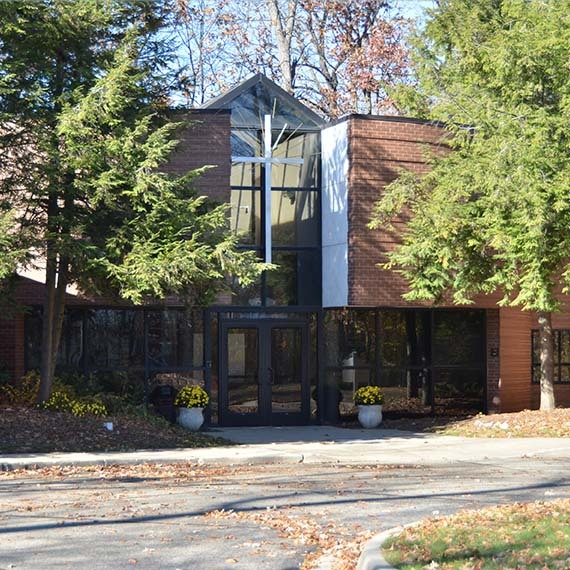 Our students not only attend religion class in each grade level, but also learn about God through weekly and special liturgies, chapel services, sacramental preparation and retreats. They also participate in Christian service programs such as packing food for Kids Against Hunger, and supporting Gleaners Community Food Bank and St. Mary Magdalen’s Kitchen. From Science Olympiad to soccer, we offer many exciting activities for students and families. Extracurricular activities include student council, “Green” Team, drama/school play, band, choir, debate, Lego/robotic League, Science Olympiad, Girl and Boy Scouts and CPR training. Many of our students also participate in sports through the Catholic Youth Organization, including cross country, lacrosse, soccer, volleyball, basketball and cheer. We also offer golf, and additional intramural volleyball, soccer and basketball for interested students in kindergarten through third grade. Parents also can participate in our Moms’ and Dads’ Clubs, which provide additional support and social events for the school. There are many opportunities to meet new parents for fun and fellowship. If you are interested in sending your child to St. Patrick School, but are concerned about the cost, please talk to us. Scholarships, family discounts, tuition payment plans, and other options are available to make it possible.